NATO is expected to station additional soldiers in six member states in Eastern Europe as part of its new anti-Russian strategy. The units would be small, but involved in possible deployment of the alliance’s future ‘rapid response’ force. The additional NATO troops would be posted to the three Baltic states, Romania, Bulgaria and Poland, NATO's Secretary-General Jens Stoltenberg said Friday. Each unit would consist of 40 to 50 troops comprised in roughly equal parts of soldiers from the host nation and those from other NATO members Reuters reported, citing an alliance diplomat. The units would be involved in organizing NATO exercises in corresponding countries. They will also perform command and control functions for the future European NATO force, which is to be created over the year. The force, according to the alliance, would respond to a crisis situation within two days, with the assumption that it would counter an attack from Russia. "It is completely within all our international obligations and what we are doing is defensive and it is proportionate," Stoltenberg said, explaining why Moscow shouldn’t see the deployment as provocative. The force is expected to be officially presented after defense ministers form the 28-member military bloc been on Thursday next week. The ministers would decide on which countries would provide the several thousand troops for the force. The alliance has significantly boosted its presence in Eastern Europe last year, citing a growing threat from Russia in the wake of the Ukrainian crisis and the reunification of the formerly Ukrainian region of Crimea with Russia. NATO sees it as an annexation through military force and says Moscow may have similar plans for some members of the alliance. Russia believes that NATO is using the Ukrainian turmoil, which started with a West-endorsed armed coup in Kiev and escalated into a civil war in Eastern Ukraine, as justification for its existence and a pretext for getting extra funding from European members. The failure of many allies to meet NATO’s military spending benchmark has been for years an issue of constant bickering between Washington, which foots the biggest part of NATO budget with its European allies. "It is not possible to get more out of less indefinitely. That is the reason why we have to stop the cuts and gradually start to increase defense spending as our economies grow," Stoltenberg said. Deployment of the new troops would require extra funding from the host nations. 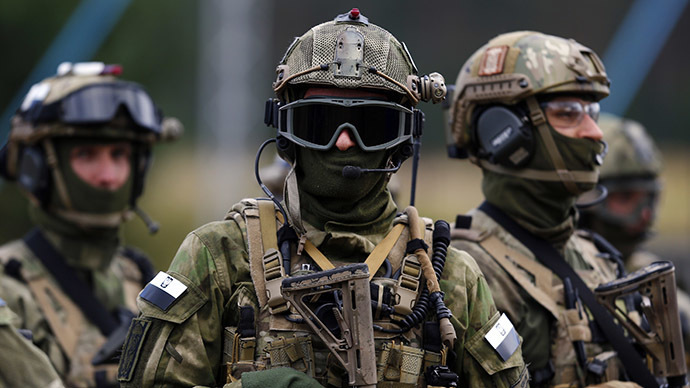 The Baltic republic Estonia alone plans to spend 40 million euro ($45 million) to accommodate NATO’s troops, newspaper Postimees reported on Saturday. The money would pay for new barracks and depots at a military base in the town Tapa, several supply facilities throughout the country and a new HQ for the NATO force in the capital Tallinn. Meanwhile France pledged to send its tanks and armored vehicles to Poland, which was pursuing for a strong permanent NATO presence in the country. The agreement to do so was announced on Friday in a joint statement after a meeting between French President Francois Hollande and Polish Prime Minister Eva Kopacz. The deployment is however a far cry from what Poland asked form the alliance back in April 2014, when then-Foreign Minister Radoslaw Sikorski asked for two brigades of armored infantry with about 5,000 troops each to be stationed in his country. Some alliance members like Germany voiced skepticism over permanent deployment of troops in Eastern Europe, expecting an angry reaction from Moscow to such a step. Under NATO’s agreements with Russia the alliance pledged not to have “additional permanent stationing of substantial combat forces” in the region. NATO has maintained a stronger presence near Russia’s border by conducting about 200 military exercises over 2014. Moscow sees this as aggressive posturing and boosted the number of exercises conducted in its territory in response.